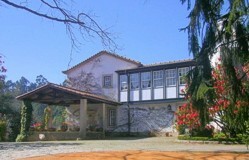 Accommodation at Quinta de Mouraes. Located in the Douro valley, one of the most beautiful regions in the country, Quinta de Mouraes is a 50 hectares estate beautifully converted to tourism. The city of Porto is just 25 minutes away. From the Quinta guests can easily access some of the most beautiful landscapes man has ever produced such as the terracing of the vineyards along the Douro valley which are well known for the production of the world famous Port wine. The area is now an UNESCO World Heritage site. The Quinta de Mouraes estate is well looked after and a walk through its 2,5 hectares garden can be a wonderful and pleasant surprise. The owners grow many plant species on the property, such as camellias and azaleas giving the property a renewed colour each season. There is even a lake where a couple of swans swim around freely. The view from the property is delightful, stretching out for miles of unspoilt country. Accommodation is on the farmhouse called Casa dos Rododendros, which was built on the 18th century and completely restored some years ago. Most details of the original construction can still be seen on the house, remarkably integrated. The house is very cosy and welcoming. Its decoration is typical of a Manor House with paintings, hand made tiles and tapesties, reflecting the opulence of past times when agriculture in large estates was indeed a profitable activity. In the house there are 3 bedrooms, one double, one twin and one single. 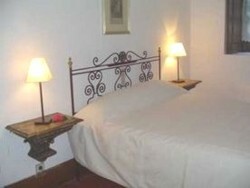 All bedrooms have a private bathroom and are equipped with telephone and air conditioning. The living room is well decorated and has a fireplace, a bar, Cable television and hi-fi. There is also a room equipped with a computer, fax machine, telephone, and internet connection. Outside, there is a swimming pool for children and another one for adults measuring 12 by 6 metres. Next to it there is a dressing room and a covered area where guests can relax under a pleasant shade during the warmer months. The house also has a laundry service. 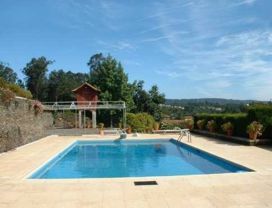 On the property there is another house called Casa do Xisto which can be rented on a self catering basis.